“Smart casual” usually refers to style of clothing and means as much as elegant, but relaxed. This term is also present in the culinary world, where the ambitious, refined culinary creations are often accompanied by a relaxed, unrestricted atmosphere. This is present not merely in the guests’ clothes or moods, but also in the attitude of the staff who, with their good spirits and relaxed behavior, far away from the near-military drill of savoir-vivre, help the guests feel at home. Such state naturally takes a certain expertise in standing canons and substantial skill, but it is absolutely possible to achieve; furthermore, it is increasingly expected and practiced. Brovaria on the Old Market Square is a mini-brewery, an excellent restaurant and a romantic, three-star hotel. Tasty dishes of the Brovaria restaurant can be enjoyed at the bar, in the lively beer room, in the atmospheric cellars or in the elegant lunch room. Culinary creations taste great in combination with beer produced in Brovaria, which is available in many, also seasonal varieties. Beer brewed in Brovaria, won at the end of 2017 three gold medals in the prestigious craft beer competition. The restaurant is housed in a restored building of a nineteenth-century printing house converted into the Concordia Design Center. After several years of operation, the restaurant moved from the ground floor to the basement of the building, and the entrance to it is on the side of a beautiful courtyard, from which you can enter up to seven bars, cafes and restaurants. Moving meant designing and furnishing the premises from scratch. So we have an old, experienced thought Concordi in completely new, very impressive interiors. The open kitchen is located in the central part of the restaurant, the space of which has been arranged in several styles. It's a great treatment! Designer and colorful Nifty No. 20 is the restaurant of the four-star Hotel Puro. Nifty escapes everything that is template, formal and boring. Everything is permitted here, apart from bad kitchen and sour expression. The restaurant surprises with both decor and excellent food. The menu features popular dishes of various European cuisines, enriched with regional Polish accents. The restaurant is located in the immediate vicinity of the Old Market. Figa has been operating on the market for almost four years. It's a nice building, interesting interior, well-kept garden and nice, close to the restaurant, competent service. We will find here elegance, which does not overwhelm and ambitious cuisine, which does not embarrass. After three extraordinary years spent with chef Lech Pluciński, Dawid Klimaniec took over the reins in Fega. Dawid managed not only to maintain a high culinary level of the restaurant, but also to keep the prestigious distinctions of the Gault & Millau Polska publishing house. The new boss is a new style, but the same quality, for which the fig is liked and appreciated. We recommend! A healthy Polish cuisine based on seasonal products from local farms and small and independent producers. The restaurant serves breakfast and an interesting menu that will work during lunch and informal dinners. Yeżyce Kuchnia is one of the premises that is strongly associated with the hipster face of the Poznań district of Jeżyce. 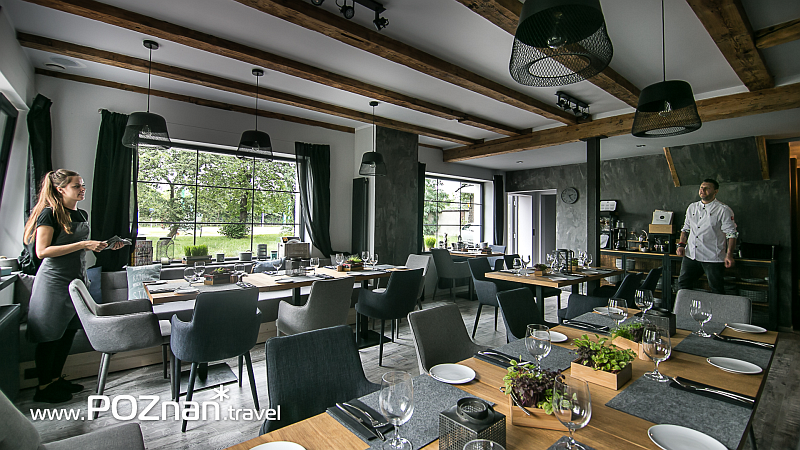 It is also one of the most interesting restored restaurants in Jeżyce.